The Fitness and Recreation Center is a 5,000 square foot fitness facility that provides the College community with an exercise haven that is conveniently located in the Jack and Rosemary Murphy Gulati Complex which also houses the new McCaffery Lounge. The $3 million, ADA-compliant renovation of the old Fournier Gymnasium into a state-of-the-art fitness center started in December 2010 and was recently completed. Under the direction of the Cassacio Architectural firm, the transformation included the creation of a 1,500 square foot mezzanine level and a cupola highlighted piazza, which will mirror the one already located between the Louge Library and Fontbonne Hall. It will serve as a picturesque entranceway to a welcoming lounge and cardio deck which includes a variety of treadmills, with iPod compatibility and touch screens, and a rower with an upper body ergometer and hydro resistance. Below, the exercise space offers Cybex free weights, a cable crossover jungle, and multiple variable resistance machines to provide an excellent source for isolated muscle training and multijoint exercises. 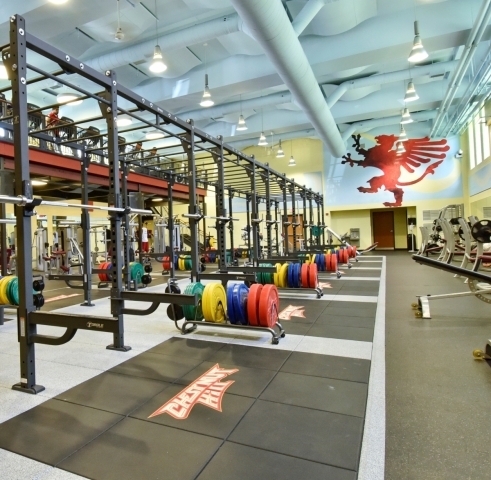 Two power racks with custom logo wooden platforms, various elliptical machines, arc training equipment, recumbent and upright bikes, offer the College's student-body and staff a magnificent platform to pursue a healthy lifestyle. In order to use the Fitness and Recreation Facilities at Chestnut Hill College, the following waiver is required. Upon completion you will receive confirmation from the Fitness and Recreation Office and permission to have your ID card programmed for access by the campus security department.